Track 1, 8 and 11 Recorded at Cherokee Studios (L.A.), Engineered by Micky Davis. Track 2, 4, 5, 7, 9, 10 Recorded at Pacific Recorder (L.A.), Engineered by Glen Nishida. Track 2, 4, 5, 7 Mixed by Kevin Valentine. Track 9, 10 Mixed by Glen Nishida. Track 3, 6 Recorded at 163 Studio (Tokyo), Mixed at Mod Studio Being (Tokyo). Track 3, 6 Mixed and engineered by Hiroyuki "Koburrn" Kobayashi. 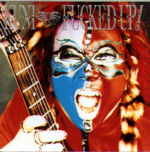 Very interesting album which includes unreleased tracks recorded between 1991 and 1992, plus a few new tracks from 1999. Album contains the song "Brite Lites" with Paul Stanley on bass-guitar (!!) as well as 5 songs with Eric Singer on drums. The 1990 tracks have Dennis St.James on lead vocals who've joined Paul Stanley's soloband in 1989 (on bass guitar) and SKULL (with Bob Kulick) in 1991, see Bruce Kulick Related Discography for full details. Kuni's second album "Looking for Action", released in 1988 is produced by Dana Strum (ex- Vinnie Vincent Invasion). KUNI : Fucked Up !